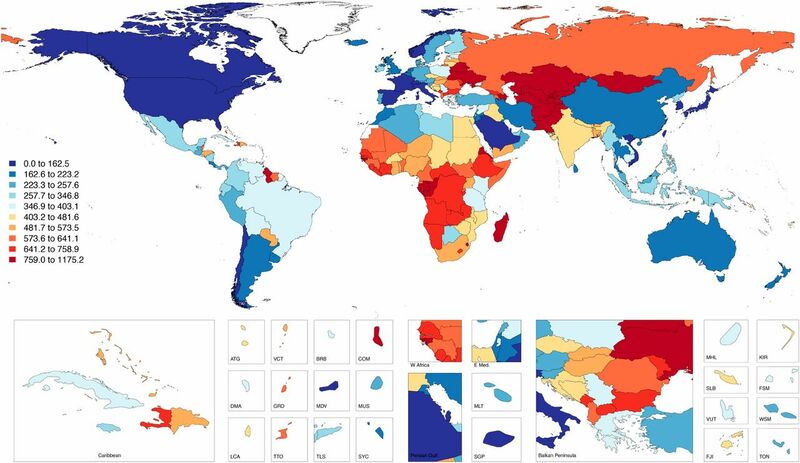 Higher burden of GFR-attributable deaths and disability-adjusted life years (DALYs) by world region in 2013. (A) Age-standardized deaths per 100,000 in 2013 attributed to reduced GFR. (B) Age-standardized DALYs per 100,000 in 2013 attributed to reduced GFR. Developed world region has lower GFR-attributable age-standardized rates of deaths and DALYs over time. 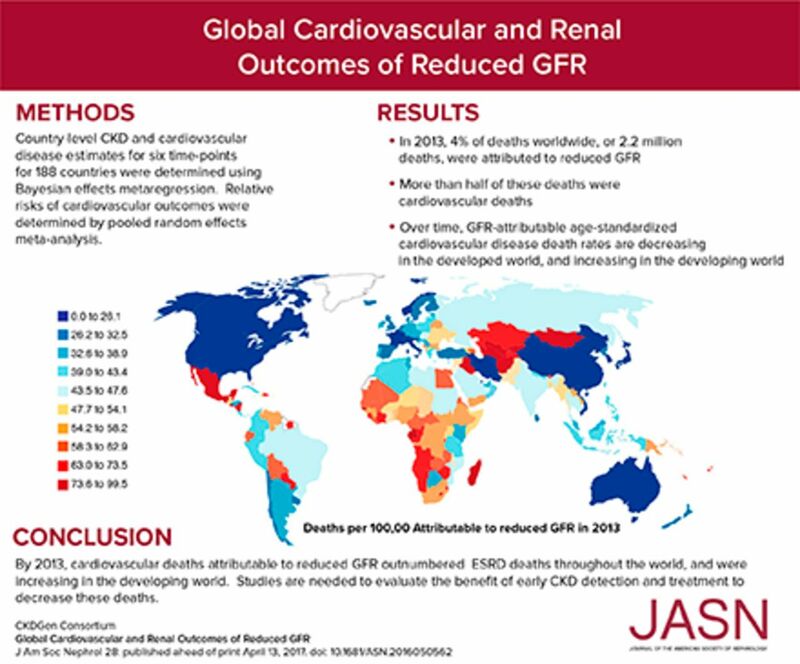 (A) Age-standardized mortality rate attributed to reduced GFR at the global, developed, and developing levels at six time points between 1990 and 2013. 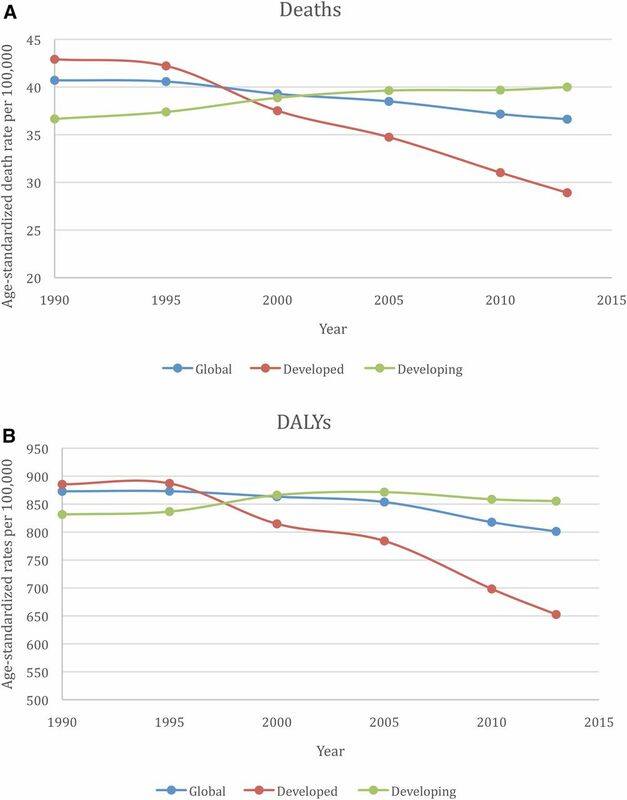 (B) Age-standardized DALY rate attributable to reduced GFR at the global, developed, and developing levels at six time points between 1990 and 2013. Fluctuating ranking of GFR risk factor by world region in 2013. 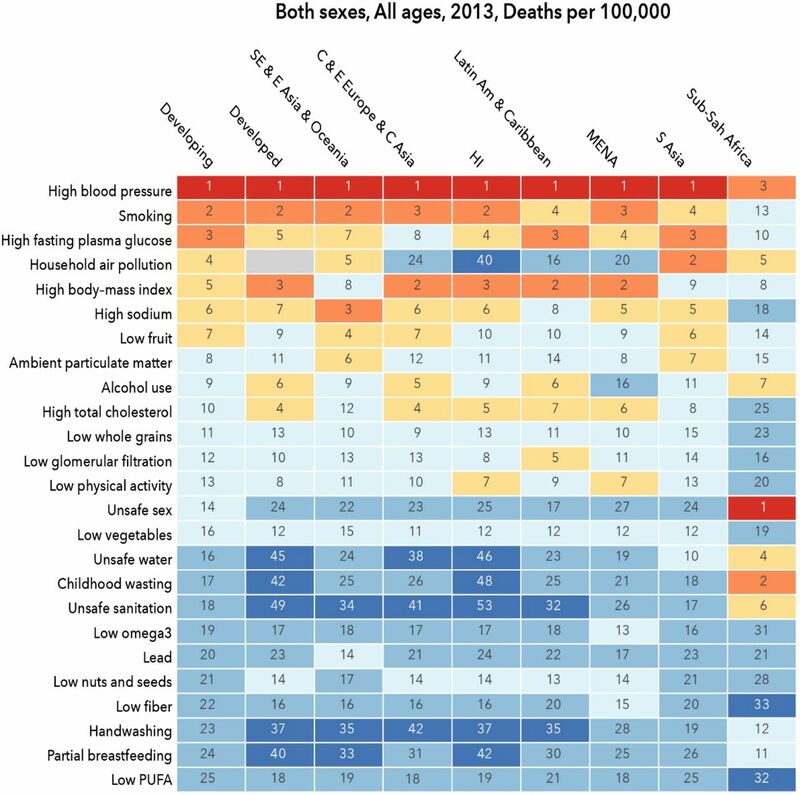 Risk factor ranking for deaths in 2013 per 100,000 among seven super-regions. C, Central; E, East; HI, high-income; Latin Am, Latin America; MENA, Middle East and North Africa; PUFA, polyunsaturated fatty acids; S, South; SE, Southeast; Sub-Sah, sub-Saharan. 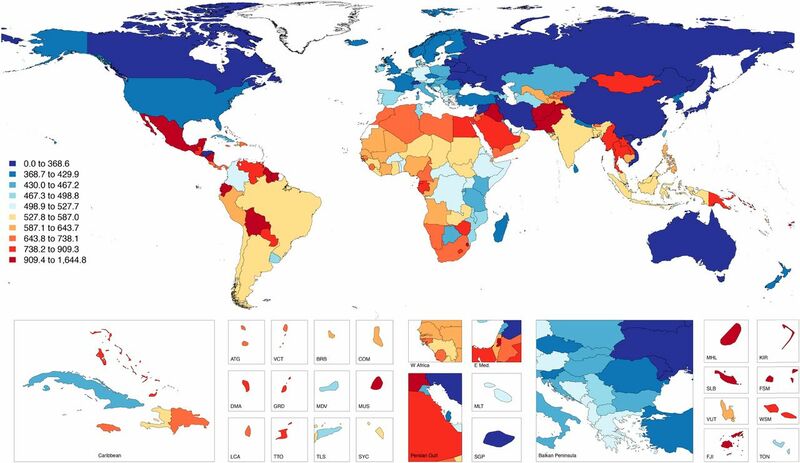 Higher burden of cardiovascular disability-adjusted life years (DALYs) by world region in 2013. Cardiovascular DALYS per 100,000 attributable to reduced GFR in 2013. 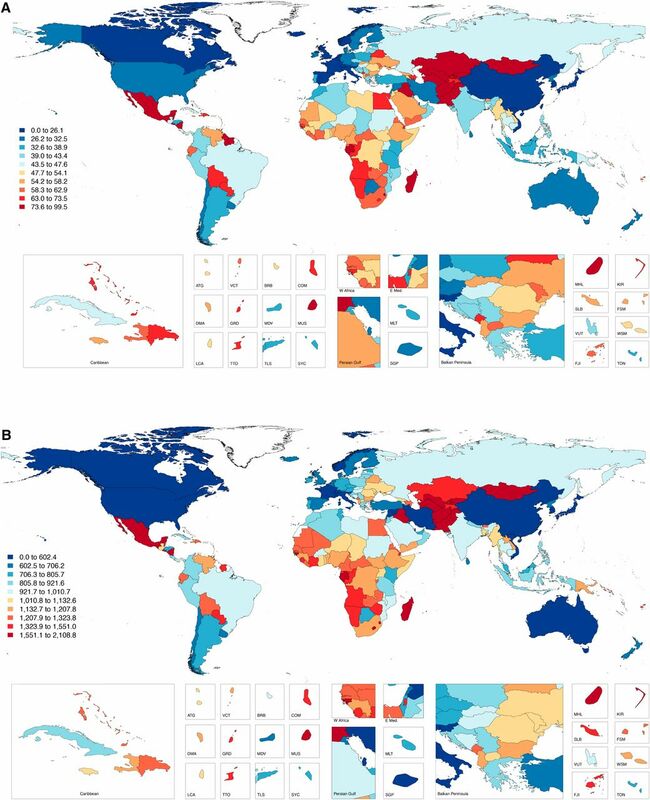 Higher burden of GFR-attributable CKD (GFR categories 3, 4, 5, and maintenance dialysis) disability-adjusted life years (DALYs) by world region in 2013. CKD DALYs per 100,000 attributable to reduced GFR in 2013. Data in parentheses indicate 95% uncertainty intervals. Data in parentheses indicate 95% uncertainty intervals. Super-regions are comprised of the following regions: High-income: Asia Pacific, Australasia, Western Europe, Southern Latin America, North America; Central Europe, Eastern Europe, Central Asia: Central Asia, Central Europe, Eastern Europe; sub-Saharan Africa: Central sub-Saharan Africa, Eastern sub-Saharan Africa, Southern sub-Saharan Africa, Western sub-Saharan Africa; North Africa and Middle East: North Africa, Middle East; South Asia: South Asia; Southeast Asia, East Asia; and Oceania: East Asia, Southeast Asia, Oceania. AS, age-standardized.